At the Judge Rotenberg Educational Center in Canton, Massachusetts, behaviorally challenged students are "treated" with powerful electric shocks for acting aggressively, rising from their seats without permission, swearing, nagging, and perhaps even "failing to maintain a neat appearance." And when they do behave? There's also a system of rewards, including points that can be spent on, among other things, "knockoff Prada purses." Only one of these practices is illegal. Thanks to Professor Rebecca Tushnet for sending the truly disturbing story from Mother Jones. Downtown style is about identity, not merely geography -- and for the past season, the YSL Downtown tote has ensured that celebrities and like-minded fashion followers can carry their neighborhood aura wherever they go. Naturally, knockoffs haven't been far behind. Sharp-eyed Counterfeit Chic reader Lara not only noticed The Bag Lady scolding the otherwise stylish Nordstrom for carrying a disreputable copy, but later saw the same copy at Burlington Coat Factory -- marked down to USD $7.99. 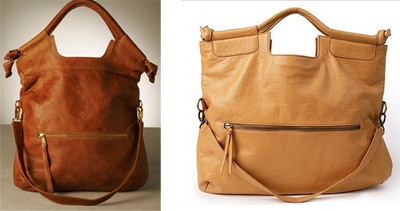 Lara pronouced the knockoff "obviously fake and trashy," with a bottom that sags and distorts the shape of the bag. And whether your goal is uptown elegant or downtown cool, a saggy bottom isn't part of the picture. P.S. Love the design but not the price? Bag Borrow or Steal has a metallic pewter version that will take you wherever you want to go. Dawg tired: Crocs "alternative" asks, "Is Toyota a knockoff of Ford?" And finally, Counterfeit Chic readers may remember Jessica Kagan Cushman's bracelets, made of fossilized mammoth ivory and allegedly copied by Chanel in resin (and by others in plastic and magic marker). Not only did Jessica craft a witty scrimshaw response to Chanel, but she also decided to knock herself off with a less expensive resin diffusion line. Congratulations on winning the race to the bottom -- for now. ...that Elizabeth Arden's PR department is working overtime to deal with this -- ahem! -- oversight in its ad campaign for the Britney Spears Believe fragrance. True, nobody is likely to confuse Britney with a charity (of late a charity case, perhaps), and fragrance and socially conscious t-shirts hardly fall into the same category. The use of a typeface and colors so extremely similar to Mondonation's just doesn't pass the smell test, however. Stealing is bad; stealing from a social enterprise is worse. What does it say about the modern era when you wake up and put on a save-the-world-type t-shirt, only to find yourself a walking billboard for celebrity perfume? How many angels can dance on the head of a pin? Absent an answer from the medieval scholastics, one might ask the U.S. Court of Appeals for the First Circuit. There's no question that defendant Target, the exclusive U.S. licensee of the Cherokee brand, and Target's supplier, Style Accessories, based their pendant design on someone else's angel. 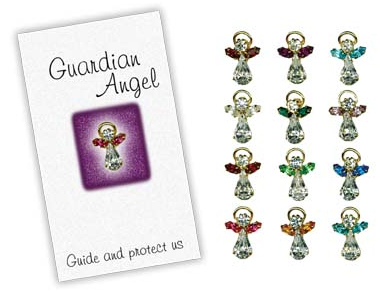 The problem for plaintiff Mag Jewelry, however, was that Target's template wasn't Mag's copyrighted angel but the apparently identical design of a third party, Alan Gregerman -- a former supplier to Style Accessories. 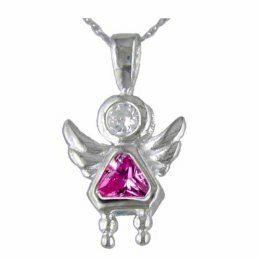 In other words, Gregerman theoretically had a case against Target and Style, but Mag Jewelry didn't, even though the Gregerman angel design (above left) and the Mag Jewelry angel design (below) appear to be exactly the same. Why? Because Gregerman claims to have created the design on his own, and true independent creation of even an identical work is not a copyright infringement; indeed, such independent creation will support a separate copyright. Since Target's supplier had admittedly purchased Gregerman's design, it had no need to look to Mag's version when it decided to make copies. Why, then, didn't Mag Jewelry challenge Gregerman's unregistered design? As it turns out, Mag Jewelry had done just that -- shortly after receiving its copyright registration in November 1995. Gregerman responded that he'd actually been the first to create and market the angel design. 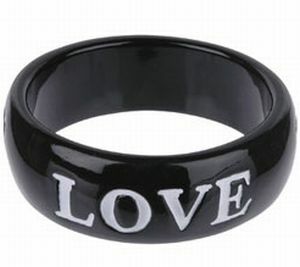 Mag and Gregerman ultimately reached an agreement under which both would continue producing the design "as copyrighted by Mag Jewelry Co." In its litigation against Target, Mag attempted to characterize this agreement as a license to Gregerman, which Gregerman denied. 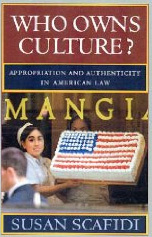 Mag also argued that the angels Gregerman sold to Style Accessories in 1997 and 1998 were of the Mag design rather than the Gregerman design, even though there's no apparent difference -- a claim that both the district court and the court of appeals seemed to find nonsensical. At the end of the day, the 1st Circuit affirmed the trial court's grant of judgment as a matter of law for the defendants and went a step further, reversing the trial court's decision not to award attorney fees. So much for Mag Jewelry's guardian angels. Counterfeit Chic is left to wonder, though, why Mag and Gregerman, as owners of identical designs, didn't just join forces against Target et al. What kind of deal (if any) might the directly copied Gregerman have struck with Target? And might a darker angel have been involved somewhere? P.S. The angel design at issue is not currently available on Target's website -- but perhaps this one represents its evolution? The trademark tango: "Nobody puts Lionsgate in a corner"
As a law professor, very few of my professional engagements require false eyelashes. On Friday, however, I taped a segment of the Tyra Banks Show on -- what else? -- fake fashion, and her talented hair and makeup team definitely raised the glamor quotient beyond the usual academic levels. I can't reveal the details of the show yet, but after watching Tyra, you may never look at a Gucci bag the same way again. The episode will air this fall; I'll keep you posted on the specific date. 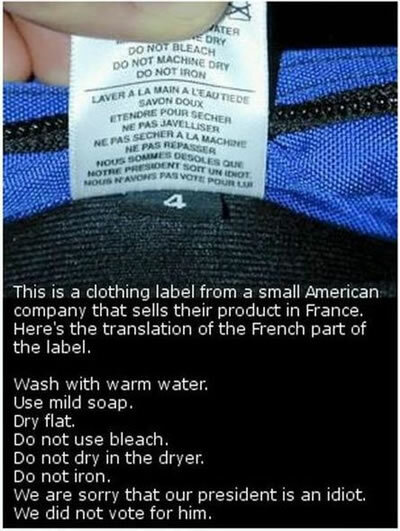 Here's a label that hasn't been copied yet -- but it should be. For the good of the American fashion industry. From Lucky Puppy, via Oddee. "I'd rather go naked than wear fake Chanel"
After Courtney Love was busted for wearing fake Chanel couture to Paris Hilton's birthday party, she wrote an "in-depth letter of apology" to the angry designer, offering to make amends. A most gracious response from the couturier, who shot the photos himself, and skilled PR alchemy all 'round. Echo chamber: Is China's growth counterfeit? Glam slam: Tiffany wins injunction and cash against Starglam, Inc. Performance mart: The counterfeit buyer as "confidence man"
The Senate version of the Design Piracy Prohibition Act, S1957, has only just been introduced, but it's already having a deterrent effect. A prototype of a bag Sarah Jessica Parker and the Bitten design team never approved for production was inadvertently produced by Steve & Barry's. When the error was discovered, production of the bag was immediately stopped. 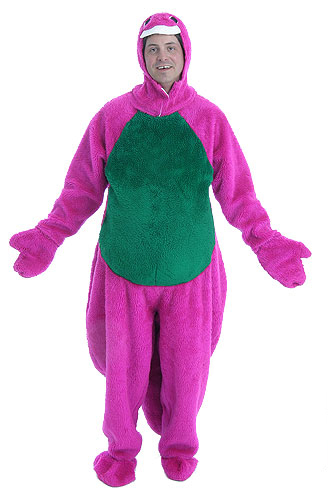 It was never put on sale at Steve & Barry's stores, and images of it were eliminated from all marketing materials. This unfortunate incident has resulted in Steve & Barry's examining its entire production process and making appropriate changes to help ensure this type of error doesn't happen in the future. Is Steve & Barry's sincere, or is SJP just trying to avoid the bad publicity garnered by other celebrity copyists? Time will tell. For the moment, however, the blogosphere is watching. The suspicious similarity between the bags was originally noted on Fops and Dandies (after a picture of the Bitten version appeared on NYT fashion critic Cathy Horyn's blog) then republished by Fashionista before being picked up by the actual print edition of the Times. Nice catch! Despite Tory Burch's lawsuit earlier this year, copies of her Reva ballerina flat (top) continue to proliferate. From below left, check out versions from Wanted, Steve Madden, and Payless. Until recently Steve Madden also allowed online customers to design their own knockoffs, complete with several different choices of gold or silver metal disc. Maybe they ran out of the ornaments -- or maybe they had second thoughts about stepping on Tory's toes. 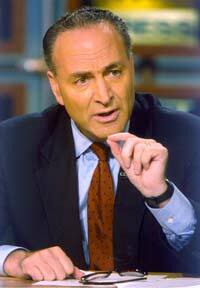 Not content to just drop a bill in the hopper and head off on vacation, Senator Chuck Schumer today held a press conference in support of S1957, the Senate version of the Design Piracy Prohibition Act. Joining him were Rep. Jerry Nadler and a formidable phalanx of fashion folk including Jeffrey Banks, Narciso Rodriguez, Nicole Miller, Marc Bouwer, Richard Lambertson, Yeohlee Teng, Dana Foley, Susan Posen (CEO of Zac Posen), Stan Herman, and Steven Kolb. Both lawmakers noted the need to close the loophole in intellectual property law that leaves fashion unprotected, unlike books, movies, or music. As Nadler put it, "Kate Winslet's movies are protected from pirates. Kate Spade's handbags are not." Of course, Winslet is British, so if she were to create handbags, her national law would protect them as well -- but you get the point. Now if we could only get these guys out of their standard-issue dark suits and red ties -- in August heat and humidity, no less. I suppose some things you just can't legislate. For those of you who have been asking about the text of S1957, here's a preintroduction copy as submitted, complete except for the current list of co-sponsors. Stay tuned for the official version. Cheap knockoffs are usually about instant gratification -- but Steve Madden is allowing customers to preorder the Larrk (right), a blatant copy of Christian Louboutin's Caracolo, down to the signature red soles. Risky business -- not only because shoe lovers hate to wait, but because now Louboutin's lawyers have time to seek an injunction. UPDATE: OK, the red Steve Madden Larrks have a red sole, but the leopard version appears to have a leopard sole, the black & white houndstooth version a houndstooth sole, etc. 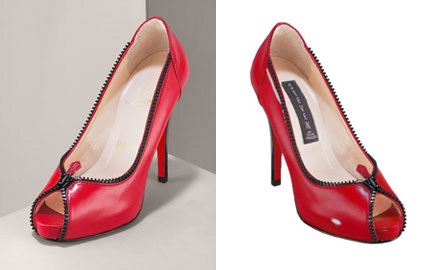 Independent design decision or a subtle undermining of Louboutin's claim that the red sole is nonfunctional trade dress, not dictated by any particular design necessity (including the need for harmonious or matching colors, a form of aesthetic functionality)? Time will tell. Imagine your humble blogger standing on a soapbox, shaking her forefinger at a crowd of aspiring creative types and offering one simple but important bit of advice. Now imagine the members of the crowd with their own fingers stuck firmly in their ears. This seems to be what happens, figuratively speaking, whenever the issue of whether a designer should use his or her own name on the label arises. It's a BAD IDEA -- at least from a trademark perspective. Let me explain. 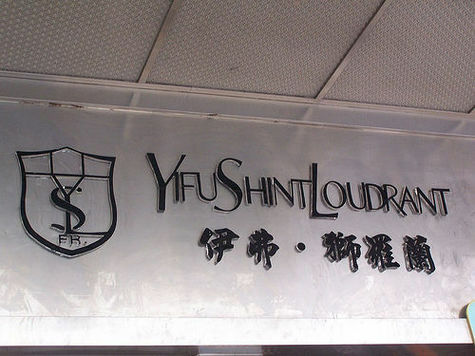 Every new business needs a name. And if that name is going to appear on goods or be associated with services, it ought to be trademarked to protect it from misuse by others. A trademark is an important corporate asset, indeed, maybe the most important corporate asset for many businesses. If the new business grows and attracts a majority investor, the investor will naturally want control over the corporate assets, including the trademark. So far, so good. But what happens if the original creator of the business -- like the designer with his or her name on the label -- ultimately leaves the business? The investor keeps the trademark, and the designer walks off nameless into the night. OK, I'm dramatizing here -- the designer can still use his or her name personally, and without a "formerly known as" in front of it. There's no need to throw out the monogrammed towels in the guest bathroom or to try and convince Mom to pick another name for her darling child. 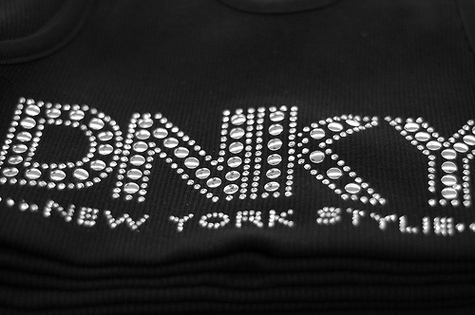 As a trademark, however, the name is lost to its former owner. 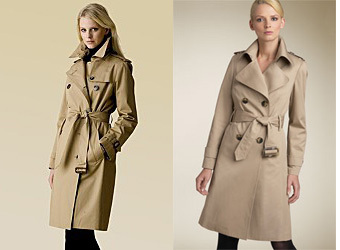 Moreover, the original designer has no control over the designs now sold under his or her name. Not convinced? Ask Jil Sander, Helmut Lang, Elizabeth Emanuel, Cynthia Steffe, Paul Frank (born Paul Frank Sunich), Roland Mouret...or go back in history and learn a lesson from Halston (born Roy Halston Frowick) or the immortal Coco Chanel. About as subtle as a sharkskin suit, but apparently effective. The designer's planned new line will be called "Jaz." Why only one "z"? 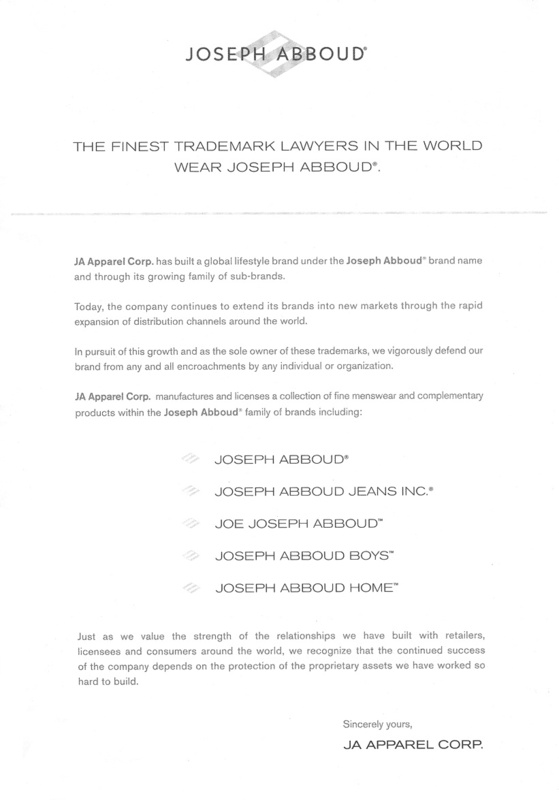 According to DNR, Abboud "claimed to favor the snappy, abbreviated version -- and it was infinitely easier to trademark." Of course, some splits are more final than others. Jimmy Choo pays to license his name back from its owners for his couture collection, and Kate Spade recently announced that she will remain on the board of her Liz Claiborne-owned label even as she leaves her previous role. Still, why do so many fashion designers, in particular, risk having their names amputated? Surely the pleasure of seeing the letters printed on a few inches of ribbon isn't that compelling. Perhaps it's tradition, perhaps ego, perhaps the belief that personality can be a powerful sales tool. One thing is certain, however: it's not because their lawyers recommended it. I'm done -- you can take your fingers out of your ears now. Counterfeit Chic loves the buzzing Bs of summer -- baseball, beaches, and last-minute bills. The U.S. Congress is in recess, but Senator Chuck Schumer (D-NY) didn't leave Washington before joining a bipartisan group of colleagues in introducing a Senate version of the Design Piracy Prohibition Act, S1957, on Thursday. Now HR2033 has a beach blanket bingo partner. I'm off to jury duty this morning--with none other than New York City Mayor Mike Bloomberg, who is also scheduled to do his civic duty today. Let's hope for an intellectual property case! In the meantime, check out this series of counterfeit fashion photos from the marvelous Petit Musee des Marques, one sample of which is below. A couple will look familiar to Counterfeit Chic readers, but there's lots of twisted new creativity out there! After one fashion assistant's roman a clef became a best-selling novel and a hit movie, knockoffs inevitably followed. 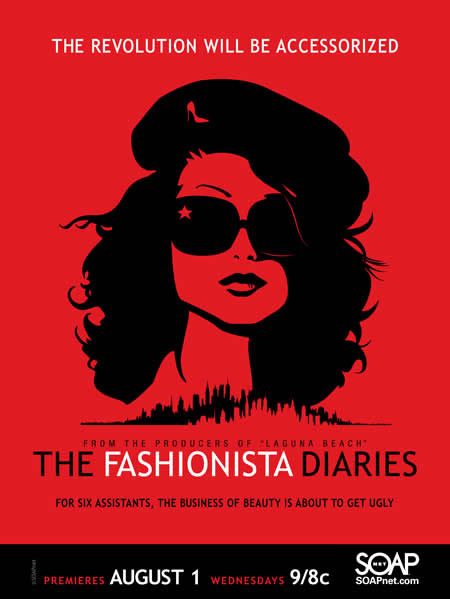 The lastest entry is The Fashionista Diaries, a reality TV show that drops 6 interns into Fashionworld, including the offices of soon-to-fold Jane magazine. Right now, I'm loving my Steven by Steve Madden black patent leather Mary Janes --- because they look like Manolos! The Steve Madden shoes that most closely resemble both those on said intern's feet and the beautifully balanced creations of Manolo Blahnik (left) are the "Vyxen" style (right) -- but the master has little to fear. Apart from issues of craftsmanship, placement of straps is a tricky matter. Perfect location highlights the instep and makes arch reference to the flat, round-toed Mary Janes of childhood; a too-high strap merely shortens and widens the leg. Unfortunate -- but internships are about learning, I suppose. There is one good thing to come out of the not-terribly-revolutionary show, however: great ad graphics. 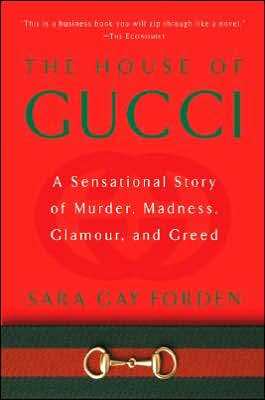 La famiglia Gucci has, of course, had a sufficiently colorful history to fill a book. Literally. Stories of private-label manufacturers appropriating designs or doing deals with competitors are quite common. A complaint recently filed in Nevada offers a new twist, however. According to the allegations, wholesaler Shylaa Creations provided convertible dresses and skirts made from vintage saris to Instyle Trends, which sold them under its own label. Instyle also photographed the items for a brochure, which Shylaa liked so much it wanted to use as its own. Although Instyle denied permission, Shylaa went ahead and used the photos on its homepage -- after having first altered them by removing Instyle's marks, changing the coloring, and cutting off the models' heads. Below is a sample of the photos filed with the complaint. The first set is allegedly from Instyle and the second from Shylaa Creations. Shylaa Creations does not concede InStyle's claim that its photos are slightly altered copies. You decide. Perhaps Shylaa believed that it could avoid claims of copyright infringement by using only portions of the photos. If the claims are true, however, heads are likely to roll. And if not, Ichabod Crane may have found his true love at last. UPDATE: Defendant Shylaa Creations' attorney does not wish Counterfeit Chic to report the above allegations, which are contained in a federal complaint. As is apparent from the post ("According to the allegations...." "Perhaps...." "If the claims are true...."), Counterfeit Chic takes no position as to the allegations' accuracy. I do, however, take a position on the legitimacy of reporting allegations of copying. The post stays.